Whether you already live locally, have just moved into the area from elsewhere in Merton or are a new resident from further afield, the Raynes Park & West Barnes Residents’ Association welcomes new members. Membership of the Association costs just £3 per household per annum. To join us, contact Andrew Barwick here. Keeping a watching brief on large-scale planning applications, making objections where these are seen to be necessary, and keeping Members informed of the Action they should take. Taking up Highways issues with Merton Council and by bringing to Officers and Councillors the concerns of local residents. Endeavouring to ensure that there is proper consultation on local issues and that the majority view holds. Taking a keen interest in all matters of concern to Members, including educational issues, health issues, transport issues and environmental issues. Encouraging and advising Members on which authority to approach in order to sort out a complaint. We also represent our Members on other bodies and forums. However, the Association DOES NOT get involved with neighbour disputes. It has been through the Association that numerous clubs were first started that have gone on to thrive. These are now listed on the inside front page and remain affiliated. The household subscription to the Association is still only £3.00 per annum and for this Members have a body that can co-ordinate campaigns to keep our lovely area safe from over-development. To do this successfully we need to have as many Members as possible to boost our integrity and also ensure that we get things right. Since 1928, The Association has worked continually with local Councillors, businesses and other organizations to serve the community, nurturing and preserving local amenities and maintaining the character of the area. We care about our community; our schools and colleges, history, policing, health services, public transport, roads, foot-paths, parks and open spaces. 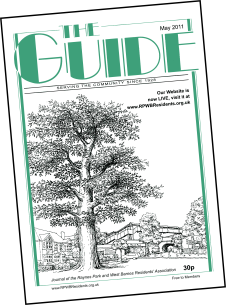 We also publish The Guide, our monthly journal with pages of local news, features and reports from our affiliated clubs and social organizations; as well as lots of other interesting information. Outings to places of interest are also arranged and are popular. The letters section usually has many contributors and is a good barometer of the local issues that concern residents. We hold quarterly meetings which all Members are invited to attend - an opportunity to get to know your fellow residents from across the area. We welcome new members - the larger our membership the more pressure we can exert on officialdom in matters of local concern. If you would like to become a member, please contact Andrew Barwick by email using this link or on 020 8543 0978.
by paying a little extra, to have The Guide posted to them each month. For details, please contact Andrew Barwick.